NekTek is an athletic neck brace designed to protect athletes during high-impact sports without disrupting gameplay. The product inflates upon impact to support the athlete's neck, and immediately deflates so the game can continue. Working with a close-knit team of 5, we created Nektek's brand image and built a website that reflected their company's needs. To create NekTek's brand identity, we asked our clients a series of questions to get a clear idea of their company values and the goal of their website. Our clients wanted to communicate the message that their product is as safe as it is lightweight and breathable. Their goal was to present an atmosphere of futuristic technology and innovation. Nektek's vision for their brand image was futuristic and clean. Their requests included the colours blue and yellow, and a logo that was simple, modern, and diverse. After much brainstorming and ideation, we finalized NekTek's brand image. The purpose and goal of NekTek's website was to educate potential consumers about the product, and show stores in which their product was available. 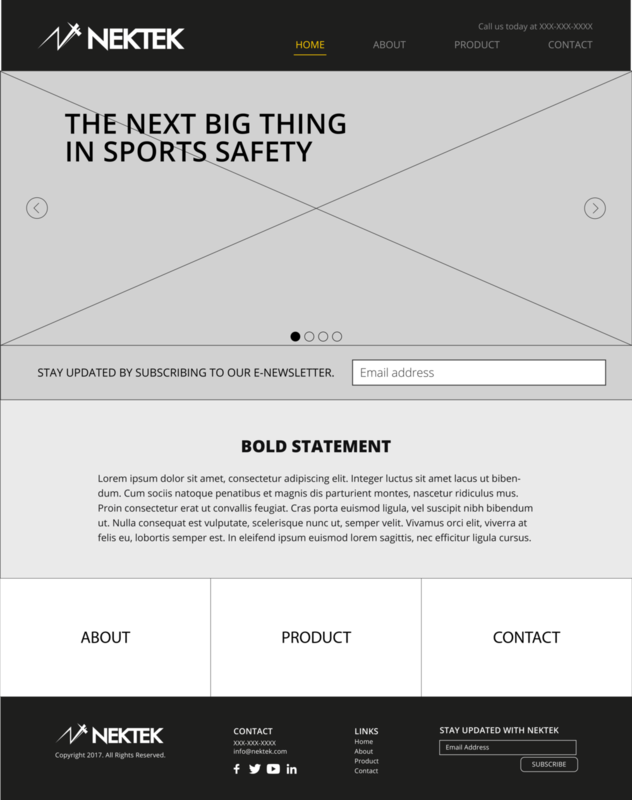 Our client requested simplistic but visually dynamic design, that communicated the company's values. We divided the structure of Nektek into four pages. The home page captures the user's attention with large visual graphics. The team page allows the user to learn more about each NekTek member with a photo and short description. The product page displays a diagram of the product, describing each feature and allowing the user to read past consumer reviews. 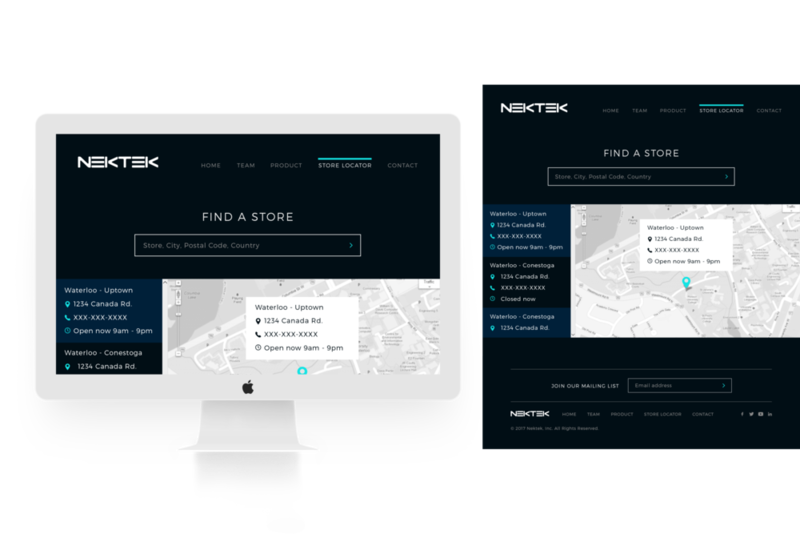 The Store Locator page allows the user to connect with NekTek through e-mail or find a store that carries the product on a map. We conducted User Testing with athletes in a range of ages, as well as parents who had kids that played sports. Each user commented that the website was easy to navigate, and the purpose of the website was clear. However, the users felt as though the structure of the site was too generic and there was little to no indication of the NekTek's brand identity. The final mockups focused more on the NekTek brand experience, while staying true to our original structure. The pages were more dynamic and had a distinct identity. This experience was a great way to gain experience in working directly with a client and applying my skills in graphic design, user experience design, and marketing tailored to a specific demographic. I also developed my communication skills after learning the importance of thoroughly understanding our clients' requests and presenting our ideas effectively. Overall, I gained valuable insight on what it's like to apply my skills to create a client's vision rather than my own.